Recently I’ve been receiving a lot of support requests from the same kind of issue, how to improve deliverability of emails from WP Email Capture. 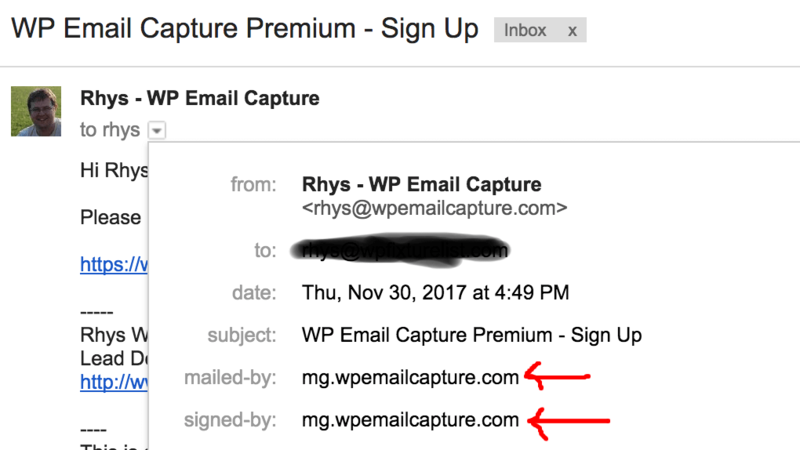 I must admit this is a problem I don’t have as I’ve gone through the process before, but if you receive an email from WordPress (such as a password reset) you can receive emails from WP Email Capture – we use the same method of sending emails. With that said, it’s always good to improve the deliverability of emails. Here’s a service that I use to improve the deliverability – Mailgun. Mailgun is a Transactional Email Service API. What does that mean? In short it is a service designed to send emails that sites send through it. So things like the aforementioned password reset, but if you run an e-commerce store, it can be used to send receipts, account details, as well as emails sent by WP Email Capture to encourage users to sign up to your mailing list. It’s not designed sending marketing emails, as it’s more low volume but secure. And because it doesn’t send marketing emails, you can improve the deliverability of it. It’s email server is managed by a company called Rackspace, and they are a high end server, set up to send emails. I use it on this site, and you should use it too. Mailgun also allow 10,000 emails per month for free – that’s more than enough for most sites. When you sign up to Mailgun, you need to add your domain. Click on “Domains” and “Add Your Domain”. This is who you will be sending email from, so it should match your website address (so for this site we would make sure it is subdomain.wpemailcapture.com). 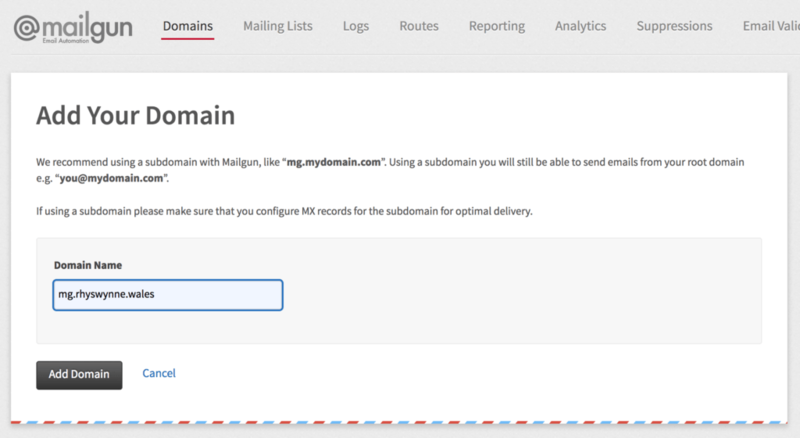 Make sure that the subdomain it isn’t in use (Mailgun recommends mg. subdomain) and click “Add Domain”. After adding your domain, you will need to add a couple of TXT records to your domain. Log into your domain registrar and add the TXT records recommended from Mailgun. Return to Mailgun, and click “Check DNS Records Now”. It can take a while to propagate, but if you add the TXT records correctly, your domain should switch from “Pending” to “Active. 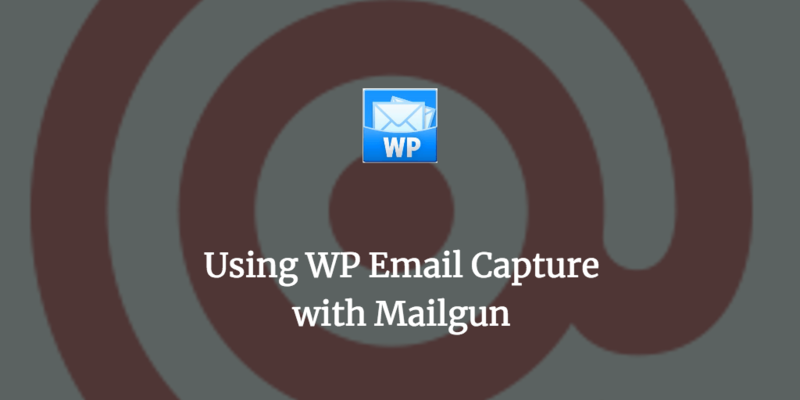 Finally, you need to install Mailgun for WordPress plugin. Install it however you usually install plugins, activate it, and then go to Settings > Mailgun. You should get a screen that looks like this. Be sure to add your Mailgun Domain Game and your API Key (which is available after activating your site). Click Tracking and Open Tracking doesn’t work with WP Email Capture, so make sure these are “No”. You can choose your From name and From Address, but make sure you add the Mailgun Domain Name, API Key and make sure Click Tracking and Open Tracking are switched to “No”. Save, click “Test Configuration”, and an email will be sent to your admin emails. You can test with WP Email Capture, and when you test, click to open the headers. The mailed-by and signed-by should be the domain of your site, (in this case mg.wpemailcapture.com). This confirms that emails are being sent via Mailgun. And that’s it! You should have less emails going into spam, and you should have more signups. Please let me know if you have any questions. Get the power of WP Email Capture Premium on your blog today. With Stat Tracking, multiple lists and custom templates to your email lists, WP Email Capture will soon become your new favourite Email Marketing Solution for WordPress. Get 10% off WP Email Capture purely for subscribing to our newsletter. Join 373 users on our newsletter! Celebrating the Launch of My New Company with This Year’s Best Offer! WP Email Capture 3.6 Released – More Gutenberg Changes! Subscribe to the blog to receive updates. Join users on our newsletter!